Finally! Today I'm giving you the other half of my notes and pearls of wisdom from wonderful speaker and author Nancy Cobb who I had the chance to hear two weeks ago (for the first half, click here). Thank you loyal readers for putting up with my blogging style that says, "Tomorrow I'll be writing on...." and then the next day I totally write on something else. Now, don't you love to read posts that encourage or challenge you to be a godly wife? That kind of pre-qualified, focused surfing is not a waste of time, but can speak right into your life from like-minded Christian wives. So now, I want to tell you about a new Pinterest Board that I'm excited to be a part of! Christian blogger and author Courtney Joseph has added me as a contributor to a new Pinterest Board on her Pinterest page called Inspiring Christian Wives. You will love reading the pins of the wives she has invited to post there. I'm honored to be among them. To God be the glory! Don't you love finding out about a gold nugget like that among the huge waters of the Internet? You can also find that board on my Pinterest page by clicking the Pinterest symbol on the top right hand corner of my website, or by clicking here. 6. Respect and accept your husband as he is (Nancy did qualify this to say if he is asking you to do immoral things or abusing you to seek counsel immediately). Say in front of the children things like, "I respected the way you handled that." 8. Point eight said, "________________ for a married woman," but I missed getting that point! I have what the point meant though! (if you figure out what went in the long blank, then tell the rest of us!) I'm not a perfectionist or I could never blog! Ha! Ha! Boy, have I thought about what this point meant a bunch since Nancy said it. It was based on Genesis 2:18 which states that it's not good for man to be alone! Is your husband lonely? Be his companion! You are his helper! Model noticing him and teach your children to say hi (as well as you) as your husband comes and goes. Learn what interests him. Really learn about it. Nancy's husband loved football, and she bought a book on football. She learned so much and she could really discuss football strategies and plays with her husband. They were such companions with football that they eventually traveled to the Houston Astrodome to watch it live! 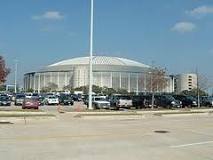 This is the Houston Astrodome where Nancy and her husband once went to enjoy a big football game! She learned all about football to be a good companion so he would not be alone, and to help her husband. Now it's a fond memory she now enjoys as her husband has gone on to be with the Lord. Nancy was also her hubby's companion as he cut grass! She would literally watch him cut the rows and she would bring him a cool towel to wipe his sweat and a large glass of iced tea. She would compliment him on how nice the grass looked to the point he would often say, "So how do you want me to cut the grass today? On the diagonal? Which way do you like best?" 9. Be submissive to your husband. (1 Cor 9:3; Ephesians, sorry I will update where this is later today! If you get to it first, feel free to put it in the comment section below:) She simply stated we all know what submission means because it is all in society—department stores, police, military, etc. She said do these things a little bit at the time. She said don't try to suddenly do them all at once. She said she began doing them over a three day period at a time in her life when she was dissatisfied with her marriage and she said you can jump start your marriage in three days. She remembers her husband spoke unkindly to her one evening. The next morning she greeted him with the newspaper, coffee, and a kiss. He replied, "I don't deserve this the way I talked with you last night." She responded, "I love you. I want to do this for you."